When you’ve worked in the hair care industry for a number of years you often feel that you’ve tried and tested every single hair product on the marketplace. From coloring treatments to conditioning masques, you’ve tried each and every one before establishing your firm favorites. So when you come across a new product that knocks those old favorites off the top spot, it’s an incredibly exciting time. This is precisely what has happened at Sachi Studios with the discovery of René Furterer’s fabulous range. French stylist René has actually been working to on finding natural solutions for the hair and scalp since the 1950s. His years of dedication have resulted in a simply fantastic product line that blends nature and science seamlessly in order to create beautiful hair. The Volumea range is a great example. The shampoo, conditioner, conditioning spray and volumizing foam are perfect for men and women with fine, flyaway hair. The use of carob extract contributes to fuller, bouncier hair with reduced static, which is particularly good news over the winter months when static is at its worst. The Okara coloring products range is also fabulous. 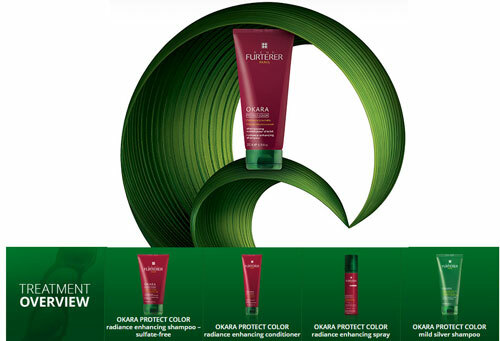 Soybean extract is the star behind the Okara offering, which includes shampoo, conditioner, radiance enhancing spray and mild silver shampoo. Similar in its structure to keratin and rich in amino acids, soybean extract restructures the hair from root to tip, leaving it sleek and smooth. Meanwhile, Hamamelis extract acts as a powerful agent for fixing pigment, leading to long-lasting, vibrant color. The use of color protection products is important if colored hair is to remain looking at its best for as long as possible. Environmental factors can impact on color and cause it to fade, but color protection products such as the Okara range offer maximum resistance to this process, keeping color looking better for longer. One of the other great features about the René Furterer range is their aroma. The Okara products mix notes of grapefruit, peach, raspberry and rose in a luxurious blend that feels like you are treating your head to a spa day. The Volumea products favor rose, lemon and thyme. Products like these can make such a difference to clients’ hair and it’s wonderful to be able to share details of them. Whenever a client leaves Sachi Studios they always look fabulous, but it can be hard to recreate that ‘salon fresh look’ once you are back at home. Thankfully, due to the René Furterer range, doing so just got a whole lot easier. Full-service designer and hair color specialist Rodney Gentry can be reached at Sachi Studios in Scottsdale AZ. Call 480.639.2000 to make an appointment and ensure that you get the color you deserve. Copyright © 2015 Rodney Gentry - All rights reserved.